Hello Kitty Cafe is coming back to San Jose. 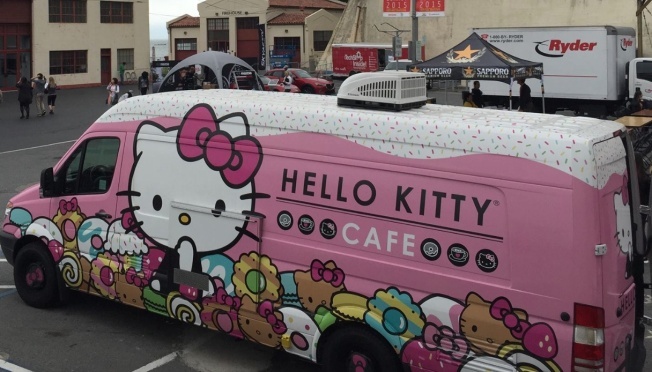 A food truck called the "Hello Kitty Cafe" will sell sweet treats and cute merch is coming to the Bay Area. The vehicle, a pink Mercedes, will park and open for business at Saturday's Cherry Blossom Festival in San Francisco. The Hello Kitty Cafe will also visit Santana Row in San Jose from 10 a.m. to 8 p.m. on April 30 and 10 a.m. to 5 p.m. on May 1. One does not merely waltz up to the Hello Kitty Cafe, which has been greeted with huge lines at previous appearances in San Jose and San Francisco, though. Plan accordingly to avoid disappointment and experience the desired cute overload. Those who brave the waits will have the chance to purchase brand new Hello Kitty treats such as a box set of French macarons featuring a surprise Sanrio character, a three-piece cookie set, mini cakes, t-shirts, water bottles and mugs.